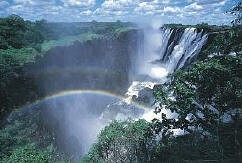 Livingstone Zambia the Adventure Centre of Southern Africa! If you love adventure… thrive in casual dress on your holiday, …enjoy the feel of freedom from the normal shackles of life, the exhilarating experience away from your usual routine... Is that you? Hop into a jet and land at Livingstone International Airport. Driving from the airport through and past the town…just on your right…and there it is. The Adventure Centre of southern Africa. It's both a building and also refers to the area surrounding Victoria Falls. The Adventure Centre houses most of the adventure companies and they’ll let you on into their secret… ie allow you to make a choice of your adventure. Alternatively four kilometers up stream above the Victoria Falls turn left to the Zambezi Water Front. They'll arrange an adventure for you. Again the choice is yours. And then you'll discover why Zambia is Africa's best kept secret. Fishing for sharp toothed tiger, fat bream, vundu (catfish). Canoeing to view game: elephants, hippos, crocodiles, etc. A real close encounter with the waterfall while smugly comfortable in a chopper, a chopper, microflight or indeed a small rigid-wing plane. The exhilarated microlight flights with wind in your face. The unforgettable great sights of the waterfall from above the Victoria Falls. The site of the white water rafting on 23 wild rapids on Zambezi River below the Victoria Falls. River-boarding by surfing the raging Zambezi. Tandem kayaking with experienced kayakers who will take you through the raging rapids - great fun and quite safe. Jet boating down the Batoka Gorge. Houseboating to watch the exquisite African sunsets...oh and the romantic star gazing. Canoeing safaris along the Zambezi River, great game viewing. River cruises on the African Queen boat; breakfast, lunch and suppers. The Zambezi Waterfront located just 4 km upstream of Victoria Falls is a large serviced campsite, a tented village and en-suite chalets ... a complex with a restaurant, shop and the "adventure centre." Watch the falls from a steam safari train and step back in time to this romantic era on an excursion from Livingstone Station. Bungi jumping off the Victoria Falls Bridge, just about the highest in the world at 111m free fall of adrenaline rush with a 100% safety record. Over 50 000 jumps to date. Abseiling the gorges 53 metres high down stream of the Victoria Falls. The 50 metres fall Gorge Swing off the edge of the cliff. The Flying Fox, a cable slide high above the gorge to "fly" across the gorge. The Boiling Pot right where the great current and whirlpool of water finally meet. The Kalahari red sands at the bottom of the falls - this provided the colour theme of the Zambezi Sun resort. Horse riding safaris, a unique way to view game. Elephant back safaris, tame elephants give the best game viewing. Legendary walking safaris are the best on the continent. 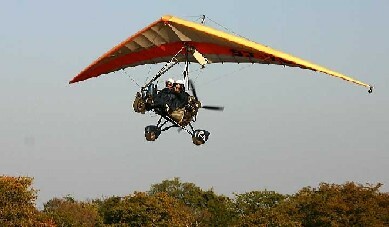 Micro light flights to see game from the air in the Mosi-oa-Tunya National Park. Fixed wing flights in a Cessna called "Flight of the Angels." And the game drives too! Chief Makuni's Village of about 6,000 people living like they have always done. The Maramba Market where all manner of goods African is sold. Negotiate! Livingstone town tour: a town of three museum and old architecture from the previous century. The Railway Museums of old railway derelicts rehabilitated to their original decor. The Livingstone Museum housing the most comprehensive collection of memorabilia of David Livingstone. The many shrines for rituals by the Mukuni people of the Toka-Leya.. The Victoria Falls Field Museum built on an actual archaeological dig of the Stone Age people. The Victoria Falls Craft shop with all kinds of items in African art. Great gifts and memorabilia from Africa. And the scenic beauty of riverine forest along the banks up stream of the Zambezi ably described by the famous Scottish explorer Dr David Linvinstone in 1857, "…scenes so lovely must have been gazed upon by angels their flight…"The Livingstone Island known locally as Siloka Island on the lip of the cliff where the water cascades. The island is unique on the Zambezi and has many historical myths, rituals and folklore. Zambia, the adventure travel country, is home to the Victoria Falls, the wild Zambezi River, teeming wildlife and the warm African welcomes …all these are found in one friendly country!